Need more information about booking Home 7280108 ? , Stone walls half a meter wide, large windows with double glazed windows in all rooms, bathroom, kitchen, living room there are wooden beams of the north, The property is located in the old town, is listed as heritage protected, the street where is located the house is very quiet, much silence 7 days a week, the house is very cool in summer and warm in winter, at the top level has stunning views across the pla de Mallorca is and marine Llucmayor, is very close to the mountain, the garden has trees and various plants and lots of privacy, surrounded by stone walls, almost all the houses on the street are stone and the narrow street, so it gives an atmosphere of typical old Majorcan town house, the house is south facing. It has sun all day. The house is in the center of the island, so it is very interesting to go north, south, east and west of the island, the town has supermarkets, pharmacies, restaurants, bars, almost all banks, the train communicates palm, and Manacor, Inca is 2 kms from the village and is the 2nd most important city in Mallorca, is a village surrounded by quiet mountains, leave the car near the apartment is one of the benefits, housing is behind Aymans palace. is a palace that belonged to the Counts of Ayamans and has some beautiful gardens with all kinds of trees. 2 double rooms with large windows with double glazing, wooden beams in the two rooms, both have guidance, south so you have sun all day and overlook the street, they have wood cabinets, radiators in all rooms , there is a comfortable, old big door, have almost 4 meters high, in the living room there is a folding bed for one person, you can move to any part of the house the floor is very old terrazzo. Lloseta is a small mountain village, it is a town that maintains its customs, authentic Mallorcan here live people who work the countryside, away from the busy life of coastal areas and the city. 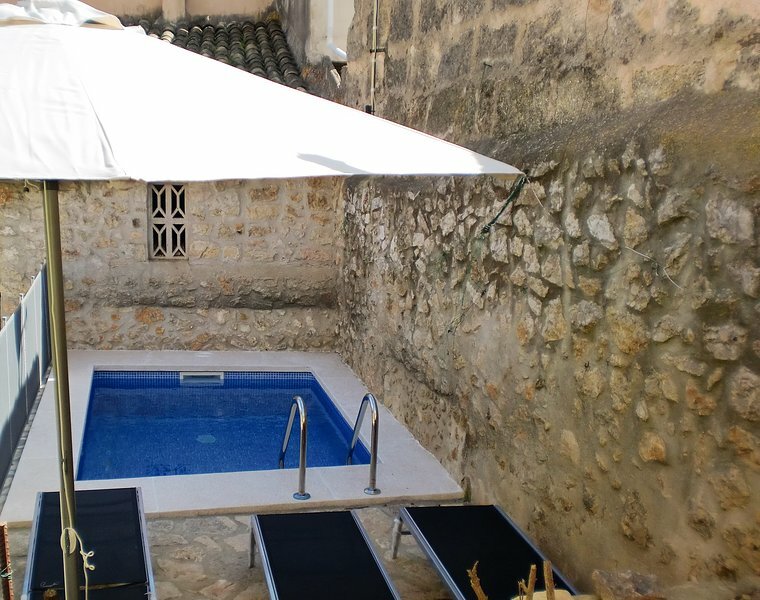 It is a quiet, traditional village, there are all kinds of establishments, has train connects Palma and Manacor every 20 minutes is 20 minutes from the beaches and Palma. It is ideal for cycling and hiking, spa and restaurants nearby. the bathroom is, complete toilet, sink, bidet, is square, with wooden beams, mirror with wooden wardrobe, plugs wardrobes, stoneware tiles, the tiling to half the wall to keep an old character, is a bath very spacious. Registration number L12 E 14666 metors pool is 4.20 x 3.50 meters is a pool for relaxing and sunbathing.